FROM the rhythmic piano of Charlie Kunz and the classically-furnished duets of Layton & Johnstone to a quirky array of oddities such as Leslie Sarony’s Ain’t It Grand to be Blooming Well Dead and the beergarten hits of The Obernkirchen Children’s Choir. 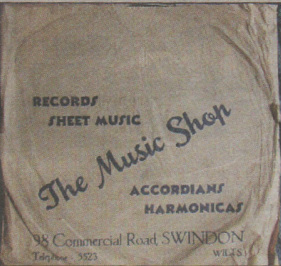 There was no lack of music in pre-war Swindon… and no lack of music shops from which to acquire it all. 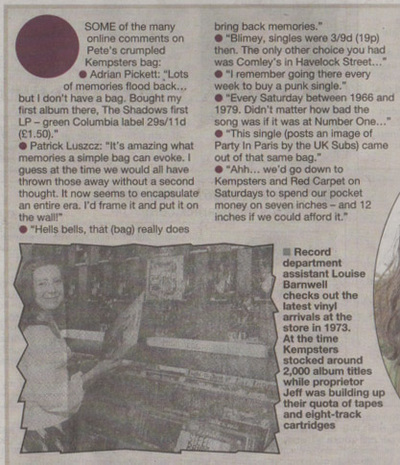 Our article on the discovery of a stripy paper bag in which Swindonians of various musical persuasions brought home their newly acquired rock’n’roll, punk, northern soul and chart records from Kempsters during the Seventies provoked some sepia tinted memories. It also produced – from a reader who wished to remain anonymous – a cache of aging ten-inch 78s discovered in a battered old suitcase during a house move. These scratchy old discs harked back to the days when local music shops, mostly in the “between the wars” period of the Twenties and Thirties, used their own customised and often fanciful sleeves in which to house the platters they sold. Kerslake’s were based at ‘Melody House’, Regent Street (Tel: Swindon 526) with a branch in Cricklade Road. Their sleeves show images of what are now considered antique records players but at the time were state-of-the-art – one contained in a cabinet with a wind-up handle. It stocked records on some of the biggest labels of the day: Columbia, His Master’s Voice and Itonia while also selling “all that is best in wireless”. The only 12-inch platter among the crop (Barn Dance b/w The Valeta by Harry Davidson and His Orchestra, in case you were wondering) was released a decade or so after most of them. And it was sold – da dah – at Kempsters. Or at least the emporium that musician Jack Kempster founded when he relocated to Swindon from Trowbridge in 1952. It was called The Music Shop then, selling accordians and harmonicas along with records and sheet music. The plain brown sleeve, though, was a clear precursor to its well-known yellow and white successor, using the same familiar typeface. Upon seeing the sleeve for the first time in decades, Jack’s son Jeff, 68, who stills runs the shop which continues to sell instruments but gave up on records 28 years ago, said: “This certainly predates the stripy one by some considerable time. IT is just an old bag really – a throwaway item of which several thousand were produced over the years and duly consigned to the bin without a moment’s thought when its purpose had been served… which in most cases was as soon as you got home. But oh my! What vivid, colourful memories were evoked by an image recently placed on the internet of what is almost certainly one of the few surviving paper bags that were, several eons ago, dispatched on a daily basis from family-run Swindon music shop Kempsters. So, musician Pete Cousins – aka Teddy White – was enjoying a good old rummage through a box of 45s at his Old Town home when he suddenly produced, Eureka-like, that once familiar yellow and white stripy bag with the distinctive purple/mauve lettering. For Pete, images of the first Canned Heat album, The Beatles’ Sgt Pepper’s and myriad treasured singles on long-departed, dearly-beloved vinyl labels such as Coral, London America, Pye International R‘n’B and Fat Possum swiftly tumbled forth. What did Pete do next? Put it on his Facebook site, of course… triggering a host of comments about the heady days of rock‘n’roll, soul and punk when three minutes of exciting, engaging music pressed onto a seven-inch plastic platter that span around on your turntable at 45 revolutions-per-minute ruled the day. And for many Swindonians these precious, prized, oft-played and inadvertently scratched items were acquired at Kempster & Son, located – just as it says on the bag – at 98 Commercial Road. The business is still going strong at the same premises today – though it has been more than quarter of a century since they sold their last record, having long since abandoned vinyl, cassettes and eight-track cartridges to focus solely on instruments. At the mention of the eye-catching paper bags proprietor Jeff Kempster, 68, who took over the business from his father Jack more than 40 years ago and continues to work there today, instantly responds: “Oh yes, the yellow striped ones. We used to order them by the thousand.” It was, as a 27 year-old Jeff recalled in a 1973 Adver feature, a “do or die gamble” for his late father Jack, a piano tuner and repairer, to leave Trowbridge to set up Kempsters in Swindon in 1952. Pianos, accordions, brass instruments and sheet music were the staples before Jack branched out and started selling “harmonicas and a few 78s” (records that played at 78rpm.) Towards the end of the 1950s they began stocking singles along with electric guitars and amplifiers as rock’n’roll gripped Swindon – or at least those bequiffed younger elements newly enraptured by the likes of Elvis, Chuck Berry, Bill Haley… This is what Jack Kempster, himself an accomplished musician, told the Adver in May 1961: “Rock ‘n’roll is one of the finest things that could have happened for younger people. Three years later Jack reported a run on harmonicas due to the “sudden popularity of rhythm and blues. Groups like the Rolling Stones use harmonica very effectively indeed…” He added: “It’s all a case of keeping up with the Joneses really.” The Brian Joneses, presumably. 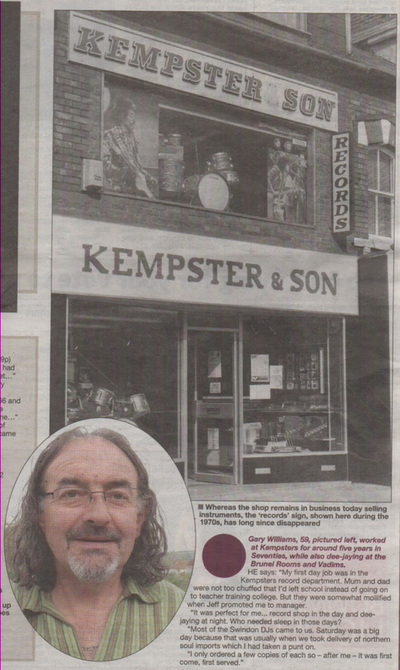 Our 1973 feature on Kempster & Son spoke of the shop stocking 2,000 album titles, an extensive range of singles, 80 tape cassette titles “and roughly the same number of cartridges” (remember them?) from the downstairs premises. Meanwhile, musicians from as far as Bath and Gloucester patronised the “flourishing musical instrument department” upstairs. Former Commonweal student Jeff, we reported, was building up the cassette and cartridge side of the business while continuing to stock soul and r‘n’b imports from the States for a hardened horde of slavering aficionados and local DJs. Today he says: “We closed our record department about 28 years ago. WH Smith killed it for us, offering £1 off the Top 50 albums. It took all the profit out of it for us. “We had three people run the record department so we couldn’t afford to run the department after that.” Jeff adds: “I still miss the record department. It’s a great shame. I loved playing them.” REFLECTING on his Kempsters paper bag Pete Cousins, 65, whose bands have included Tomorrow’s Children, Teenage Polecats, Stadium Dogs and various Teddy White incarnations, says: “If I’d kept every one of these bags I’d have to build a new shed. “I was nine or ten when I bought my first single from Kempsters. Over the years I must have bought about 80 per cent of my music from them. GARY Williams, 59, worked at Kempsters for around five years in Seventies, while also dee-jaying at the Brunel Rooms and Vadims. He says: “My first day job was in the Kempsters record department. Mum and dad were not too chuffed that I’d left school instead of going on to teacher training college. But they were somewhat mollified when Jeff promoted me to manager. “It was perfect for me... record shop in the day and dee-jaying at night. Who needed sleep in those days?